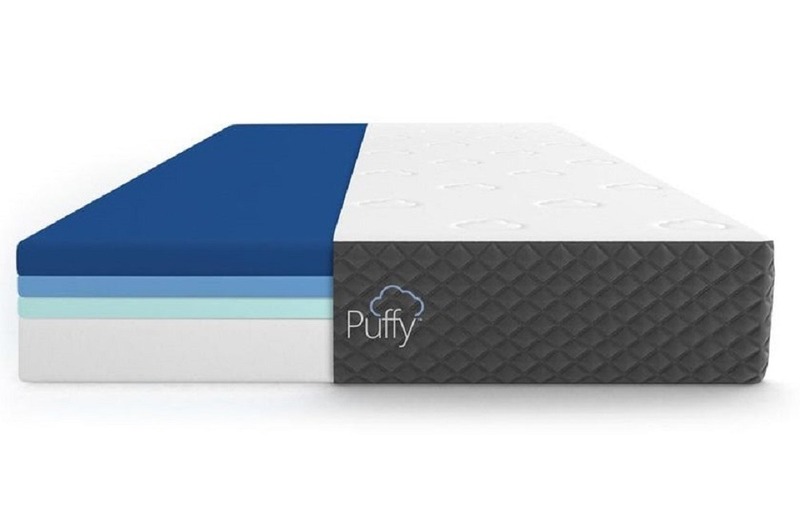 Our Puffy Lux mattress review takes a look at the new upgraded 12″ version of the original Puffy mattress that the company has recently released. The Puffy Lux promises to extend their popular existing mattress technology to a bigger, thicker, 12″ model that will appeal to heavier sleepers and couples as well. This mattress uses an additional layer of foam to enhance the features and feel of its predecessor. It is soft, supportive and luxurious, created to make you feel like you’re sleeping on a cloud, and it promises great sleep at a great price. 3″ Top Cooling layer – The top layer is made of 3″ of patent pending Cooling Cloud gel-infused memory foam that uses convection and conduction technology to disperse heat away from your body. It is designed to provide greater airflow to the mattress and create a cool and comfortable sleeping surface. 1.5″ Comfort Layer – This layer is made of 1.5″ Plush Dual Cloud Comfort foam designed to contour to your body, relieve pressure points, and provide you with a peaceful and relaxing night’s sleep. 1.5″ Support Layer – This layer is made of 1.5″ of special ClimateComfort Foam designed to keep your spine properly aligned while providing extraordinary pressure relief on all temperature and humidity levels which makes it resistant to contractions and expansions that often occur from extreme temperatures. 6″ Bottom layer – This foundation layer is made of 6″ of firm core support foam offering four times the support level of other foam mattresses available online. The Puffy Lux mattress is designed to fit any frame or surface including box springs, slats, flat frames, adjustable frames or even the floor. Its Cooling Cloud and Plush Cloud Foams work together to relieve your body’s pressure points and create a cool and comfortable sleeping surface, while the underlying Firm Core Support Layer aids in relieving pressure points and works to keep your spine aligned. The Puffy Lux has a breathable and extremely soft cover with a silky, luxury feel to it that works to wick away moisture and heat and provide you with a cool, comfortable and recovering sleep that you need. The Puffy Lux is a universal comfort model which means that it is designed to appeal to a wide range of sleepers with different sleep preferences. We felt that the Puffy Lux was firmer than the regular Puffy model, and we would say it is around a 7,5 on the firmness scale (10 being the firmest). Puffy has their own firmness scale on their site and they rate this mattress a little softer, in a range you can see below. As we always preach, firmness is largely weight dependent, and I usually compress the top comfort layers of most mattresses more than Kaye does as I weigh considerably more than she does (230lbs vs. 115). Although I compressed the top comfort layer of the Puffy Lux mattress to a certain degree, it supported my heavier weight better than its predecessor. It wasn’t so soft as the thinner original Puffy, and didn’t cause me to push all the way down through it and come to rest on the harder support layer below. The Puffy Lux mattress distributed our weights evenly both when lying or sitting up in the bed, and for Kaye it was of a perfect firmness as she generally prefers mattresses of a firmer feel. The dense foam layers used in its construction give you a true memory foam sensation and provide you with the right balance of comfort and support during sleep. Although this mattress is primarily designed for back and side sleepers, it works well for all sleeping positions. The Puffy Lux definitely provides the support necessary for side sleeping, without causing any discomfort in our shoulders and hips that some mattresses often cause. As we have already mentioned, that given we are side sleepers, the Puffy Lux perfectly supported our hips and shoulders when sleeping on our sides without causing numbness or stiffness in our limbs which often is the case with firmer mattresses. Just like the original Puffy, the Puffy Lux is a rather comfortable mattress. Its Cooling Cloud and Plush Cloud layers are designed to relax you and provide you with a cool and comfortable sleeping surface as well as eliminate stress and strain from your body. These top comfort layers work together with the core support layer to keep your spine aligned while cradling your body and preventing any pressure points on during sleep. This model is firm enough to be supportive, and yet has the softness necessary for comfortable sleep. It will make you feel like you’re sleeping on a cloud, but will prevent you from sinking too much in the foam and feel like you are “trapped in foam,” which some memory foam mattresses are known to do. The multiple memory foam layers provide a high degree of comfort and support with the Puffy Lux, and the nice thick 12″ design really supports heavier sleepers such as myself quite well. Its soft and breathable cover has a silky feel to it which adds to the overall comfort and luxuriousness of this mattress as well. The softness of the cover combined with the initial soft response from the memory foam layers made our nights truly enjoyable and this feeling was shared by both of us. The Puffy Lux mattress does an excellent job of sleeping cool. The Cooling Cloud gel-infused layer prevents the build-up of heat and regulates the temperature of your body to create an optimal level of comfort necessary for a great sleeping experience. In addition, the thin and breathable cover on the mattress provides greater airflow and aids in cooling the mattress as well. All this mattress technology combined kept us cool throughout the night and helped eliminate the problem of sleeping hot that we often experience as a couple living in Texas. With this mattress there was no excessive sweating, and we didn’t feel any discomfort or stickiness that is usually the case with all foam or all memory foam mattresses. Like we often preach, sinkage and motion transfer are highly dependent on sleeper’s weight. As I weigh more than Kaye, I usually tend to sink down a lot more into mattresses when sitting up on them or on the edge, but this was not the case with the Puffy Lux mattress. I compressed its top comfort layer to a certain degree, but it didn’t cause me to bottom out and come to rest on the foundation of our bed, which I did at times on the original Puffy which at 10″ is thinner than the Lux model. Kaye didn’t experienced the same amount of sinkage as I did given that she’s half my weight, and most importantly, she didn’t roll towards me or feel as if she was going to sink into a hole. This is often a problem with us given our weight differential, and something as a couple we have argued about and had issues with many mattresses since starting our mattress review site, Memory Foam Talk. Because I weigh twice what Kaye does, I often cause a depression in the mattress which makes her sink into me with some mattresses that have poor support and bad sinkage. Not with the Puffy Lux mattress. The 12″ thickness of the bed combined with its dense foam layers does a good job at preventing excessive sinkage, which earns it high marks in our evaluation of it. Edge support with this mattress is also good. I didn’t press all the way down through the mattress when sitting on or near its edge, and it worked perfectly well for Kaye as well. There was no sliding sensation that is seen in other all-foam mattresses. As the Puffy Lux has thick layers of durable foams, there is almost no motion transfer. This bed does an amazing job of isolating vibrations and making any movement almost unnoticeable. It is one of the best mattress choices available on today’s market when it comes to reduced motion transfer which makes it ideal for couples. It allows you to easily change positions and get in and out of the bed during the night without disturbing your partner. There was a small degree of off-gassing / smell with this mattress coming mostly from being compressed during packaging and shipping, but it was nothing overpowering when compared to some other mattresses we have reviewed. Any smell that was present dissipated pretty quickly so we give the Puffy Lux good marks in this category. Although the Puffy Lux mattress costs more than its predecessor, it is still pretty reasonably priced coming in at only $1595 for a Queen. Given the premium materials used in its construction and the overall comfort and luxuriousness that it offers, this is a decent price. The Puffy Lux mattress stands out as one of the better 12″ all foam mattresses on the market today. This universal comfort mattress is designed to appeal to a wide variety of sleepers with different sleep preferences and does a good job at providing good support and comfort. Its patent pending gel infused memory foam construction combined with Plush Cloud and denser support foam layers does a good job at providing balance and pressure relieving support necessary for a cozy and sound night’s sleep. This mattress is great for all sleeping styles, and the 12″ design does a good job at supporting heavier sleepers and couples as well. The proprietary foams used in the design of this mattress also provide extraordinary cooling and does an excellent job of minimizing sinkage and motion transfer which makes it one of the top choices for couples who tend to sleep hot and frequently change positions during the night. If you’re looking for an all foam mattress that sleeps cool and supports heavier sleepers and/or combined weights for couples, all in all the Puffy Lux is a great mattress worth the value and it is definitely an option worth looking at. Hopefully our review of the Puffy Lux mattress helps you make the right decision on your next mattress purchase! Let us know if you have any questions, and happy sleeping! Is the Puffy original mattress made with Latex? I am allergic to Latex that’s why I am asking. No, it is just a type of memory foam – not latex. Well putting a numerical value to a review is hard to really convey things. If you want to chat, email us directly at [email protected] as I don’t want to put our number out there publically. Sorry, we have been out of the country. Email us and happy to chat!